This article is about the military branch of service primarily concerned with aerial warfare. For other uses, see Air force (disambiguation). For the integral aviation services of armies and navies, see army aviation and naval aviation. Many air forces are also responsible for operations of the military space, intercontinental ballistic missiles (ICBM), and communications equipment. Some air forces may command and control other air defence assets such as anti-aircraft artillery, surface-to-air missiles, or anti-ballistic missile warning networks and defensive systems. Some nations, principally Russia, the former Soviet Union and countries who modelled their militaries along Soviet lines, have or had an air defence force which is organizationally separate from their air force. Peacetime/non-wartime activities of air forces may include air policing and air-sea rescue. Air forces are not just composed of pilots, but also rely on a significant amount of support from other personnel to operate. Logistics, security, intelligence, special operations, cyber space support, maintenance, weapons loaders, and many other specialties are required by all air forces. Arguably, the Finnish Air Force was the first independent air force in the world, formed on 6 March 1918, when the Swedish count, Eric von Rosen gave Finland the second aircraft, a Thulin Typ D. Some considered that the Finnish Air Force did not officially exist during the Finnish Civil War, and the Red Guards had its own air force. Over the following decades most countries with any substantial military capability established their own independent air forces. The South African Air Force was formed on 1 February 1920 and the Royal Australian Air Force was formed shortly afterwards on 31 March 1921, although it was not until 1922 that the head of the Service was titled as Chief of the Air Staff, placing him on a par with his Australian Army and Navy counterparts. The Canadian Air Force was formed at the end of World War I, and was abolished and reorganized several times between 1918 and 1924. It became the permanent Royal Canadian Air Force when it received the "Royal" title by royal proclamation on 1 April 1924. It did not however become independent of the Canadian Army until 1938 when its head was also designated as Chief of the Air Staff. Similarly, the Royal New Zealand Air Force was established in 1923 as the New Zealand Permanent Air Force but did not become independent of the New Zealand Army until 1937. Other British-influenced countries also established their own independent air forces. For example, the Royal Egyptian Air Force was created in 1937 when Egyptian military aviation was separated from Army command. The Afghan Air Force was established on 22 August 1924, with support from the Soviet Union and Great Britain, but a civil war destroyed most of the planes and it wasn't reestablished until 1937, when King Mohammed Nadir Shah took power. Outside of the British Empire, the Italian Royal Air Force was founded in 1923, the Finnish Air Force was established as a separate service on 4 May 1928, and the Brazilian Air Force was created in 1941. Both the United States Air Force and the Philippine Air Force were formed as a separate branches of their respective armed forces in 1947. The Israeli Air Force came into being with the State of Israel on 18 May 1948, but evolved from the pre-existing Sherut Avir (Air Service) of the Haganah paramilitary. The Japan Air Self-Defense Force was not established until 1954; in World War II Japanese military aviation had been carried out by the Army and Navy. Unlike all these countries, the Mexican Air Force remains an integral part of the Mexican Army. 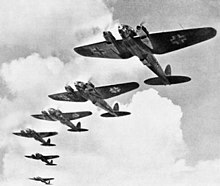 Germany was the first country to organize regular air attacks on enemy infrastructure with the Luftstreitkräfte. In World War I, it used its zeppelins (airships) to drop bombs on British cities. At that time, Britain did have aircraft, though her airships were less advanced than the zeppelins and were very rarely used for attacking; instead, they were usually used to spy on German U-boats (submarines). 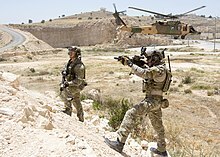 Air Force Special Forces, such as US Air Force Special Tactics, Brazilian Para-SAR, and Pakistani Special Service Wing, are used in a variety of roles including combat search and rescue, special reconnaissance, direct action, counter-insurgency, intelligence operations, and serving as joint terminal attack controllers attached to ground and special operations forces. ^ A photograph of this plane can be found in the book by Shores 1969, p. 4.